People who believe what I believe sometimes get called Trotskyites. I used to say that I didn't really know what Trotskyite meant, but I think I have worked it out. Andy Burnham’s essay in Saturday’s Guardian disturbed me. Let’s not put it any more strongly than that. I was disturbed by it. I found it disturbing. Andy Burnham is a Labour Politician. He wanted to be leader of the Labour Party, but we Trotskyites stopped him. He is probably, understandably, still a bit cross with us over that. Last June there was a Referendum. Every one in England, Scotland, Wales and Northern Ireland was allowed to vote, except the ones who weren’t. A third of us said that Britain should withdraw from Europe; a third of us said that it shouldn’t; and a third said they didn’t care either way. As a result of this overwhelming vote, we have decided to spend the next 10 years arguing about the definition of “withdraw”. During the referendum, the position of the Labour Party was that although the E.U is in some ways a flawed organization, Britain should remain a member and work to improve it. Since the referendum, the position of the Labour Party has been that since withdrawal is now inevitable we should concentrate on finding a definition of “withdraw” that doesn’t involve crashing the country’s economy. Free trade — access to the single market — is regarded as the Biggie. Andy Burnham takes a different view. He thinks that the Biggie is not free trade, but Immigrants. The party leadership thinks that we should maintain free trade with Europe, even if that means continuing to allow other Europeans to live and work in the UK. Burnham thinks that we should abolish the right of other Europeans to live and work in the UK, even if that means that we can no longer have free trade. He has, of course, a perfect right to his opinion. What bothered me was the way in which he chose to make his case. I put it no stronger than that. It bothered me. Here are some of things which bothered me about it. I agree. The referendum really only told us what everyone already knew: the country is split down the middle over the question of Europe. (So, by coincidence, are the Conservative party and the Labour party.) We need a way of going forward that the 37% of secessionists and the 35% of anti-secessionists would be equally happy with or — as is usually the case with compromises — which the 37% and 35% would be equally annoyed by. The 28% will be equally indifferent whatever happens. It is a strange world where you have a referendum, and wait until after the votes are counted to decide what the referendum means. Like going off to hunt a snark and realizing that you have no idea at all what a snark is. The Prime Minister (who campaigned for us to Stay but now wants us to Go) says that “Brexit means Brexit”, which I think means that the snark was a boojum all along. I think that most of the people who ticked the “leave” box assumed that they were voting to tear up all the agreements which have been made over the last 40 years and wind the clock back to where the country was before it joined the Common Market. In status quo res erant ante anno MCMLXXII as it were. I think this is what a Texan would assume he was doing if he ever found himself ticking a box which said “leave the United States”. But everyone agrees that whatever “leave” means, it definitely doesn’t mean that. So we are left in the charming position where politicians can pick any position they like and claim a massive (37/35) popular mandate for it. Andy Burnham “is clear” that the vote to secede from Europe was, in fact, a vote against European immigration. I am happy that he is clear, although I don't know what constitutional status his clarity has. But I don't think that being clear and being right are necessarily the same. It is clear to me that some of those who voted "leave" did so because they were sick of only being allowed to buy straight bananas and being forbidden from buying eggs in six packs. These were also lies, but they were lies on a level with the one told to the famous emperor about his famous cloak: the kind which becomes true if you believe it hard enough. Boris Johnson appeared to have some self-imposed cognitive dissonance that genuinely made him think that he hadn't seen any half-dozen boxes of eggs since 1972. It's very much the same kind of trick which allows a man to look at a huge Christmas tree in the town square and say "Of course, you and allowed to put up huge Christmas trees in the town square any more." And it is very clear to me that some of the people who voted “leave” did so because of a deep, religious belief in something called “sovereignty”. They didn’t necessarily have any problem with any specific “European” law, but they objected on spiritual grounds to people in Belgium having a say about what happens in England. Since June some of these people have been entertaining fantasies about abolishing metric measurements, restoring pre-decimal currency, playing God Save the Queen on the wireless and getting the Queen a smart new boat to play with. It seems that the dirty campaign fought by some of the secessionists is deemed to affect the result retrospectively. It is true that fascist politicians stuck up posters depicting scary brown-skinned people flooding across our borders; this makes it clear to center left politicians that a vote to leave the EU was really a vote against scary brown people. But even if it were clear that the 37% voted against immigration, wouldn’t it be equally clear that the 35% voted in favour of it? And wouldn’t it follow that if your objective were “to bring the divided country back together” you would be looking for a compromise position which the 37% who are nativists and the 35% who are multiculturalists would be equally happy with (or equally irritated by)? British parliamentary constituencies are sufficiently small that MPs get to meet a significant number of the people who voted for them face to face. This the only argument in favour of our voting system: it forces MPs to campaign at a local level, which gives voters a direct line to the center of government. If Mrs Miggins tells her MP that she is concerned about the state of paving stones on Stapleton Road, there is a chance that her MP might pass her concerns on to the Prime Minister — or, at any rate, the Minister With Responsibility for Paving Stones. I am sure that some of the people who MPs meet do have "concerns" about immigration; and I am sure that some of those concerns are sensible. "When I am not standing on the doorstep talking to you, I am a school teacher," a concerned person might say "and I am concerned that we have had 37 children from immigrant families join our school this year. I am concerned because some of them do not speak English and none of their parents do. I am also concerned because some of them have been brought up to think that it is dirty to get changed for P.E and have no idea what Christmas is." And the MP might go away and talk to the Minister for Education, and come up a solution — a specialist ESOL teacher in the school, interpreters for parents evenings, a trained mediator to deal with cultural differences about decency and modesty and religious festivals. And that would pretty much deal with all the sensible concerns. Hooray for democracy! But I do hope that my MP would only pay attention to sensible concerns. If I am concerned about foxes in the dustbins, I hope my MP might do something about it. If I am concerned about alligators in the sewers, not so much. If I am concerned about old people tripping over paving stones, my MP should probably pay attention to me. If I am concerned about immigrants coming out at the dead of night and tripping up old ladies, he probably shouldn't. Pause, for a moment, and take that in. Some people think that we should allow, or mostly allow, European immigration to continue in return for us being allowed to continue to trade with Europe. Some people think it is worth losing our free trade agreements with Europe in order to stop European immigrants coming here. Andy Burnham thinks that it doesn’t matter who is right and who is wrong. What matters is meeting public concerns whether or not those concerns are sensible. Moderates, on the other hand, think that there is black and there is white but there are also at least fifty shades of grey ranging from “slightly less right” to “almost completely wrong”. There’s also a pretty big “we don’t know” space in the middle. Andy Burnham proposes a new model. On one side is “right” and “wrong” (with gradations and don’t knows and the need for compromise taken for granted.) But on the other side is “public concerns” and “what the people on the doorstep say”. The latter always overrides the former. What matters is not what is right but what the man on the doorstep thinks is right. Vox populum super limen vox deus if I might put it like that. The person on the doorstep is not stupid. But he is ignorant. So am I. So are you. So is everybody. I, for example, am almost entirely ignorant about Science. I don’t have a head for figures or logic or the patience to do something over and over again and make detailed notes of tiny changes. I have some general sense that Schrodinger had a cat that was in two states at once, and that this illustrates that there is something in Quantum Physics (some kind of particle, I suppose) which can be in two states at once, and that this has something to do with why my I-Phone works, but that's honestly the best I can do. I could read a book, if I wanted to, but I can’t really be bothered. On the other hand, I can be bothered to work my way through text books that tell me, for example, roughly what page historians are on with regard to The Historical Jesus and laugh (ha!) when biologists say that everyone now agrees he’s a myth. Because that stuff does interest me. And it goes without saying that I have to send for a plumber to fix the simplest dripping tap or leaky washing machine. Why on earth would you ask me about physics or football or plumbling when there are people out there who know about this stuff? O.K: knowledge isn't everything. Facts aren't everything. Evidence isn't everything. Many of our strongest beliefs come down to sentiment and aesthetics. It is often a good idea (and a powerful rhetorical tool) to admit this. It’s not a great idea to claim that history proves that tyrants are never defeated by armies if the real reason you don't like war is that your Uncle Ben was killed in the Falklands. I myself am very reluctant to allow evidence to intrude into any argument about capital punishment. Actually I think the evidence is mostly on my side, but that's a fortunate coincidence; I'd be on the same side even if the evidence were mostly against me. There is no point in talking about whether your state has a higher murder rate than my state and how many innocent people your country executed last year and whether "deterrent" even means anything. The only reason I am against the death penalty is because I am emotionally and aesthetically against ritually asphyxiating helpless prisoners (irrespective of what they have probably done). To argue otherwise is to argue fraudulently. I imagine that many of the people on the doorstep know as little about economics as I do about Schrodinger’s cat, or washing machines, or, come to that, economics. I imagine many of them are concerned about immigration at an emotional, gut level. I imagine they aesthetically and sentimentally dislike hearing languages that they do not understand in the doctor’s waiting room. I imagine they sentimentally and aesthetically dislike shops selling food they don’t recognize on the high street. I imagine they sentimentally and aesthetically dislike it when people with a different word for God start saying their prayers in what used to be a cinema. I imagine they have a sentimental and aesthetic hankering for the days when nearly everyone they met looked the same as him and there were hardly any black or brown people in his part of town. Call this racism or nativism or perfectly understandable old-fogeyism. You don’t have to be old to be an old fogey. Call it alt-right or call it "genuine concerns". It's a faith position, a gut feeling, an intuition. Don't mistake it for an argument. As has been noted, Tony Blair thought that a state of mind he called “sincerity” (“just happening to believe”) was sufficient basis to start a war. David Cameron thought that a fairly technical question about voting reform depended on ineffable emotional feelings that could not be put into words. Michael Gove say that he doesn’t care about the opinions of experts — or, rather more subtly, that he doesn’t think that the populum super limen do. And Jacob Rees-Mogg has said, literally and in so many words that great political and economic questions could as well be settled by consulting horoscopes or the entrails of chickens as by consulting people who know about politics and economics. Not that Jacob Rees-Mogg actually consults the entrails of chickens to decide on economic questions. At least, I assume he doesn't. Presumably he just follows his gut instinct; does the first thing which comes into his head. Or at least, the first thing which comes into the head of the person on the doorstep. 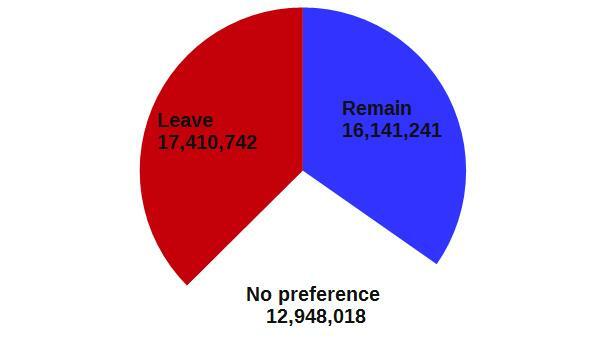 I suppose most of us voted in the referendum according to our hearts, rather than according to our heads. But the starting point of this discussion is that while the heads are more or less unanimous — leaving the European single market would be an act of reckless insanity — the hearts are deeply divided. 37% of our hearts hankered for mono-racial, mono-cultural, olde fashionede Englande; 34% of our hearts had an idealistic belief that there is only one race, the human race, and that countries made up of different kinds of people were nicer and more interesting places to live than countries where every one was the same. 37% of us want a land with a wall around it and 34% of us have a faith in our fellow man, as the bard said. What happened to seeking a unity between those two positions? “The people on the doorstep” doesn’t just mean “people”, does it? Any more than “the real America” just means “Americans”? It means the people on the doorstep as opposed to the people anywhere else — in cafes or universities or at political meanings? And I am not on the doorstep. There I times when I sincerely doubt that I am person. I am one of the 35%. I am a metropolitian elite, an expert, a luvvie, a moaner, a Trot, a Guardianista. I am also a member of a trade union, and we learned this week that the Prime Minister does not regard members of trade unions as people. My shaky knowledge of science isn’t written into my genes. I picked it up somewhere; very possibly from Star Trek. The opinions of the people on the doorstep didn’t drop out of the sky, either. They picked them up from somewhere. Very possibly from a newspaper. And I sometimes suspect that some of the newspapers have a political agenda. I sometimes think that they are deliberately trying to create the impression that there are floods and hoards of terrifying immigrants who want to steal your job, take down your Union Jack, ban your Christmas tree and force you eat straight bananas and 5-packs of eggs. I sometimes think that this reflects what their editor sincerely believes in his heart, or more likely, what would be in the owner's economic interests. If we are going to make it a general rule that the opinions of the people on the doorstep are automatically right, then you might just as will cut out the middle-man and ask the two or three zillionaires who own the press directly. Which is what you might expect a Tory to believe; but rather a surprising position for a Labour man. Vox populi super limen vox domini de ephemerides if you absolutely insist. So I think that is what Trotskyite must mean. The opposite of that. I'm only confused by one thing in your admirable exposition: does "European immigration" mean the same thing as "immigration by people originally from Europe" mean the same thing as "free movement?" Yes: "Free Movement" is the right of anyone from anywhere in the European Union to live and work anywhere else in the European Union. One of the four freedoms -- freedom of movement of goods, people, services and capital. You write near the end, "I am one of the 37%." I would have been reasonably sure that you were one of the 35% (or 34%). "We can't know that we're right or wrong. (I'm right, though)"
I think a couple of the basic problems with reconciling the two sides are the almost American-style fallacies of one side thinking it has the monopoly on compassion, and to think that everyone on the other side is some latter-day mini-Powell. (Or worse, mini-Farage) Unfortunately I can't say that many aren't, but there are motivations beyond and excluding sticking it to 'Johnny foreigners' and 'brown people'. The right-wing tabloids weren't - and aren't - the only ones waving straw men about.